Tassels are everywhere and it's the perfect way to accessorize for summer. There's something about the fun shape that screams fun, playful, and somewhat unexpected. 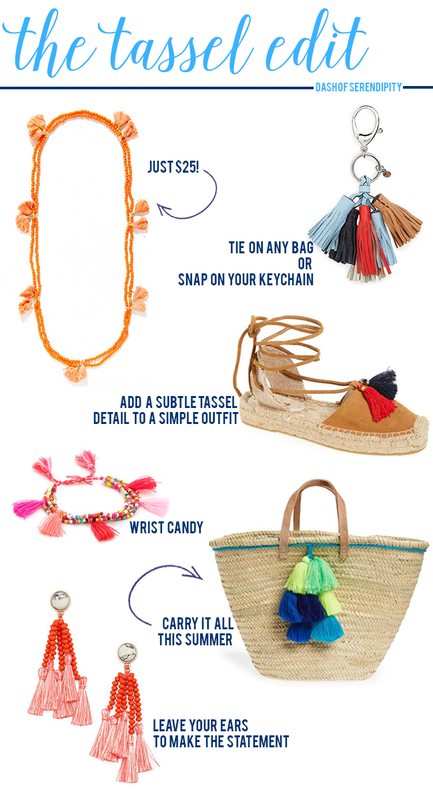 A great way to make a statement or add a pop of color, tassels can also be worn almost anywhere. One of my favorite ways to wear a tassel is in jewelry! You can see my favorite Lisi Lerch earrings worn here with a casual sweater and jeans. I love how the earrings completely made the outfit look that much more fashionable. What's your favorite way to add a tassel to your outfit? These tassel items are all so cute! Love the beach bag and the espadrilles!